A job club, also known as a job search club or a networking club, is a formal or informal group of job seekers. No matter what you call it, the club's purpose is to assist with a job hunt. If you're a member, you'll both give and get job search support and advice. What Are the Benefits of a Job Club? The most obvious benefit of a job club is that it provides you a space to get advice on your job search. Members can give you feedback on resumes and cover letters, help prepare you for interviews, and more. If it's been a while since you last applied for a job, getting insight into newer technology (like how to leverage social media in a job search) can be really valuable. Many job clubs set weekly deadlines for members to complete elements of the job search, which holds job seekers accountable. Knowing that you have a weekly meeting on your calendar, and will likely be asked about your progress, could be just the nudge you need to finally send out that cover letter or make that informational interview date. Another benefit of a job club is that it provides an informal place for networking. Not only will meeting with group regularly help you encounter new people, but club members can introduce each other to potential employers. Members can also point out job openings they think might be a good fit for other members. As well, job clubs provide support during what can be a stressful time. Job searching can be overwhelming, lonely, and isolating. That's especially true if you were fired or laid off, and went from being around a big group of colleagues every day to being alone in your home. Meeting with people going through a similar experience can provide much-needed encouragement. What Are the Different Types of Job Clubs? Job clubs vary in many ways. Some are very formal, with executive boards, monthly dues, required meetings, etc. A more formal job club may be moderated by a career counselor or other career expert. 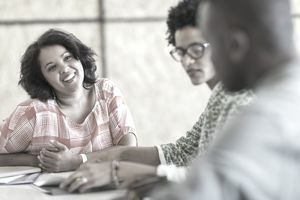 Other job clubs are much more informal, and simply offer a space for people to talk about their job search experiences. Many job clubs fall somewhere in the middle, offering members the chance to set job search goals and receive advice from their peers. Job clubs also differ in whom they cater to. Some job clubs are for specific types of job seekers, such as people looking for jobs in one industry. Other clubs are for specific groups of people, such as job clubs for women. And, job clubs can often be based around a geographic location. How Do I Find a Job Club? You can also look at your local newspaper or your chamber of commerce website for local job clubs. Browse on the Meetup website to find job clubs nearby. You can also search for Groups on Facebook or look on Twitter to see if there is a local job club. Public libraries, community colleges, and local universities also often have job clubs or networking groups, so call or check out their websites as well. If you are looking for a job club that caters to a specific group or industry, look into organizations that cater to that group. And, if your searches don't reveal a club that fits your needs, create your own. You can either place an ad in your local paper, post an invitation on social media, or gather a few friends together for a weekly lunch meeting. What's the Right Job Club for You? Try out a few clubs, if necessary, until you find one that is a good fit. While you may find job clubs that are based online, consider opting for an in-person group instead — it's valuable to meet new people face-to-face. Not only is it good practice for interviews, but you probably already spend a lot of time online, and a break from your computer screen could be a good thing.